Sup people. I don't know if you remember but a long time ago we had a discussion about how the italian bluray looks much better than the mgm release(some might disagree). Anyway, there's a guy who has taken the trouble of encoding it, cutting it to match with the english audio track and released it. I can't tell you where to go to get it but look for the release named The.Good.the.Bad.and.the.Ugly.1966.1080p.BluRay.DTS.x264-SuBoXoNe. I'll report back on how it looks once I finish downloading(it's 22gb). Thanks for the heads up. I've been looking for a link where i can download the torrent but it seems to be an older file. Hopefully, I can find it soon. Anyways, do you know what English track is used? 1999 DVD track or SE track? This took a lot of work! The Italian restored blu-ray looks great unfortunately MGM didn't release that transfer and put out a dnr to hell release with the wrong colour timing as well. The Italian blu-ray only comes with Italian language audio track So I had to sync the English Audio track witht he Italian release which has a different runtime than the MGM release. In all there were more than 50 different cuts. I decoded the DTS-HD MA english audio track to a raw .PCM file and then ran an avisynth script that cut the track to the correct synch. I then took the resulting correctly synched PCM file and loaded it into EAC3to and output the 5.1 tracks 6 seperate wav files and imput them into DTSHD.Master.Audio.Suite.V2.0 sand encoded it back into DTS-HD master audio. I muxed this release with the core dts 5.1 track but will be uploading the synced DTS-HD MA file as well. All of the log files are present in the release. I also included ITalian and English subtitles. It is a large encode but the movie is almost 3 hours long and the original source video track was around 34GB. Yeah it's the SE track I assume as the first dvd only had mono track I think? Optimal release would be this video together with the mono track and using the 5.1 converted into mono for the extra scenes. I honestly thought about doing it myself once but it's too much work. It's a lot of work but I'm going to give it a shot. I've been reading about what hardware/software I require to do this and it's a bit more difficult to figure out because I have a mac and most of the info I've come across (so far) is catered to PC users. Since LeoneNut has already done an edit called the "Rome Premiere Cut" that combines the SE DVD video with English mono audio (for extended scenes, he used the Italian mono audio with English subtitles), I'm only interested in doing a similar version for the BD format. Instead of using lossy DVD audio I'm going to capture the lossless PCM audio from the laserdiscs and fill in the blanks where necessary. I have a laserdisc player with a digital audio output (coaxial) and a M-Audio Firewire Audiophile to relay the signal to my mac (without resampling). I still need to buy an external BD writer, most likely a LaCie d2 BD-R, which is costly and blank discs. Acquiring the software/hardware is the easy part. I still need to learn how to do the editing. This is going to take a while! So you're still in the process of downloading this file? How far along are you? I downloaded the torrent file but there are no seeders. Still at 0% after leaving my laptop on all night. I'm not familiar with mac whatsoever so I can't help you sorry. As for the editing it's really just about getting the timecodes and then copy pasting I think. Maybe if you can get a hold of LeoneNut, he can give you the codes. I was not aware dvd audio was lossy. Are you sure about that? I've always been under the impression that AC3/DTS was lossless. Haven't started download yet. Don't think mine will go very fast, only has 1 seed. Started it now. Getting 3-500kb/s. Gonna take a week to finish utorrent is telling me lol. I can confirm that Dolby AC3, DTS etc are all lossy audio formats. In the case of these films with old mono tracks, I'm not sure how much of a difference it will make but I'm a bit of a purist and would like the full (i.e. lossless) audio information available. lol that's better than what I got going here. No seeders = 0 kb/s. I'm not that well versed in torrent transfers, does it make a difference where I downloaded the file from? If so, can you send me via PM your link? I'd really appreciate it. Yeah it might not be a huge difference. I was thinking that if I can get my hands on the leonenut version I'll just extract the audio from it and use that. It will be a little weird when characters suddenly speak italian but I guess one has to make a compromise. I was also thinking that converting 5.1 into mono might get messy and not worth the trouble. I got mine from a place simply known as "x264". It's a private tracker, invite only. You don't need to. The SE DVD and BD is a mixed down version of the 5.1 soundtrack, complete with botched gunshot sound effects etc. You should use the 1999 MGM DVD mono audio track and splice in the the mono audio from the SE DVD for the additional scenes. I was thinking that if I can get my hands on the leonenut version I'll just extract the audio from it and use that....I got mine from a place simply known as "x264". It's a private tracker, invite only. How do I get invited? 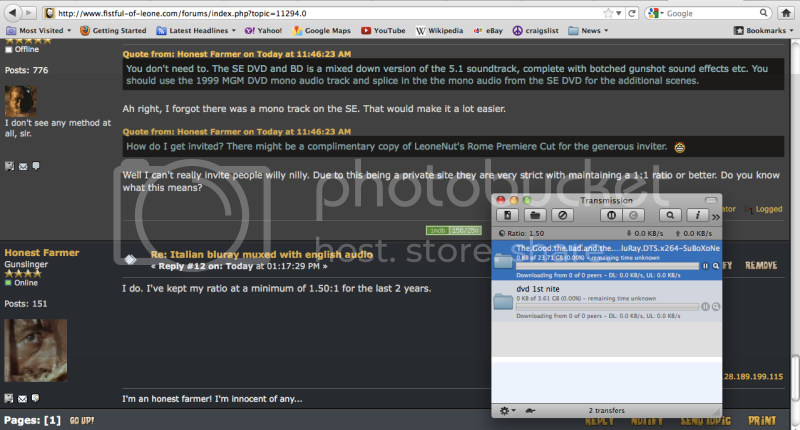 There might be a complimentary copy of LeoneNut's Rome Premiere Cut for the generous inviter. Ah right, I forgot there was a mono track on the SE. That would make it a lot easier. Well I can't really invite people willy nilly. Due to this being a private site they are very strict with maintaining a 1:1 ratio or better. Do you know what this means? I do. I've kept my ratio at a minimum of 1.50:1 for the last 2 years. PM me your email. And don't make me look bad.